Just one more day of vacation …I am ready to pack off my winter break activities and be ready for work. I made a big list of To Do’s and started working toward it only after realizing my break is gonna end. Mostly , they were about refilling the pantry and freezer supplies- Idli podi, home made ghee, home made paneer, home made pancakes, sambhar powder and snacks. The top of the list was the sambhar powder. 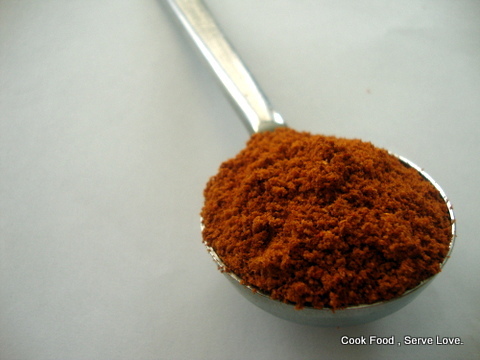 I had enjoyed my mom’s sambhar powder so long and for the first time , I had to use the chili powder from Devon market. I was nervous basically to use it as such and it consumed so much time to assemble the individual ingredients to get the taste of mom’s sambhar. 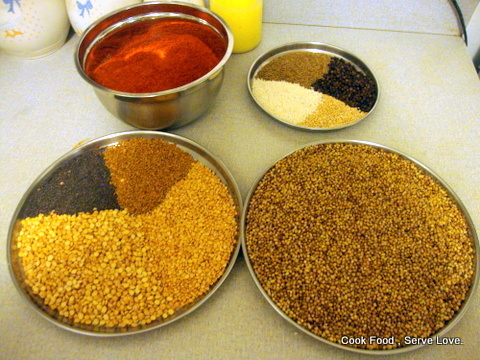 So, I decided to make a sambhar powder, which will be a great companion for cooking and as well save time. I researched, got opinions and decided to go with the following proportions. The optional ingredients , I left on purpose were curry leaves , turmeric and asfoetida (hing). Dry roast the coriander seeds, cool, grind them separately and measure out 4 cups . You can add more coriander if you feel your chili is hotter than usual. Dry roast the ingredients individually and let them cool. Powder them in a blender, mix all in a big bowl , sieve once and regrind if needed. But, the effort is worthy and will keep you happy for months to come .